In the "The Lorax," an entrepreneur regrets wiping out all the make-believe truffala trees by chopping them down to maximize his short-term gains. As the Dr. Seuss tale ends, the Once-ler – the man responsible for this environmental tragedy – tells a young child that "Unless someone like you cares a whole awful lot, nothing is going to get better. It's not." Likewise, many corporations that profit from nature's bounty, such as Unilever, Patagonia and Interface, appear to be reaching a similar conclusion. They are realizing that it's time for the business world to do more about conservation. We, two economists who have extensively researched natural resources and development, are proposing a new way to solve the problem of species and ecosystem loss. 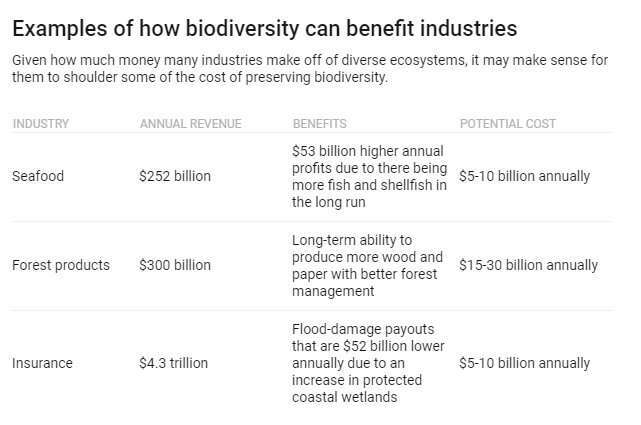 Corporations that benefit from biodiversity could forge what some are calling a "new deal for nature" by paying part of the tab for biodiversity conservation. Biodiversity, the variety of all natural ecosystems and species, is being lost at an unprecedented rate. According to the recent World Wildlife Fund Living Planet Report, the populations of mammals, birds, fish, reptiles and amphibians have fallen by an average of 60 percent in just over 40 years. The scientists Gerardo Ceballos, Paul R. Ehrlich and Rodolfo Dirzo have dubbed this decline and an impending wave of extinctions a "biological annihilation." We argue that many businesses are threatened by the loss of species and ecosystems, such as declining bee populations and dwindling stocks of fish, forests, wetlands and mangroves. Without an array of ecosystems and species, it's tough for farmers to grow crops or ranchers to raise animals. A global treaty, the Convention on Biological Diversity does set worldwide conservation targets. But we believe they may not be ambitious enough. Cristiana Pașca Palmer, who serves as the UN's biodiversity chief, is considering raising the treaty's targets to conserve at least half of terrestrial, inland water, coastal, and marine habitats to preserve biodiversity. But the existing efforts to preserve biodiversity are not only inadequate. They're underfunded. Much of the world's biodiversity is in developing countries, which lack the financial wherewithal to adequately conserve it. What's more, there is growing evidence that when corporations engage in environmental stewardship, they become more attractive investments and their borrowing costs decline. Danone, which earned $3 billion in profits in 2017, has its own $80 million "Ecosystem Fund." 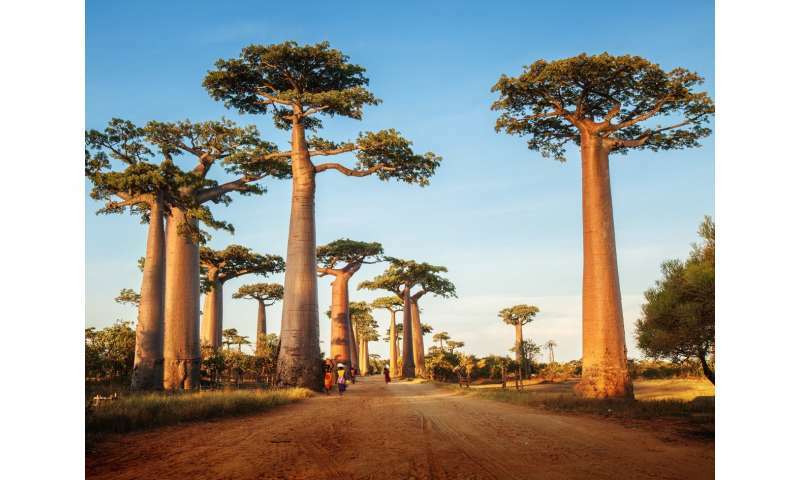 It's just one of an increasing number of companies taking concrete steps toward biodiversity protection, even though they are not required by any law or national policy. 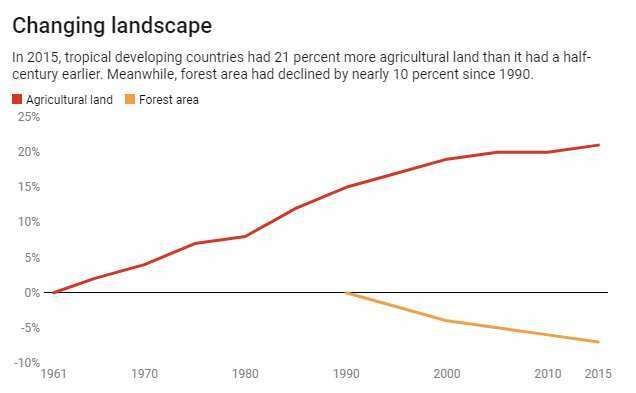 The total area of forests worldwide deemed to be subject to sustainable practices supplying the industry increased from 62 million hectares, 12 percent of the total global forest area, in 2000, to 310 million hectares in 2015, according to the industry group. That's more than half of the total global forest area. The annual revenue of the world's 100 largest global forest, paper and packaging companies is over $300 billion. But a number of companies are already showing that they believe investing in ecosystem preservation is worth it. In our view, corporate support for international biodiversity conservation is essential to prevent "biological annihilation."